It wasn’t an easy life there in the city / One girl among brothers supposed to stay home / To take care of your mother / Your future was planned out / Then Ernie turned up and he wouldn’t take no. It wasn’t an easy life with a new family / A daughter just born when the bombs start to fall / You crouched under the table, your babe tightly to you / And prayed for the day and an end to it all. Ruby they called you a bright shining jewel / You kept it together when the going got rough / You raised us three kids now that can’t have been easy / Ruby I wonder did I thank you enough. It wasn’t an easy life six in the morning / Off to work in the dark and the kids still in bed / A back breaking job and no time for complaining / Took care of the rent and kept all of us fed. Through the years and the wars and the poverty / You joked and you sang “Bless this House” every year / I still talk to you, on your birthday I sing for you / Your spirit still lives and I still feel you here. It hasn’t been easy, since you’ve left us / Ten years have gone and that void can’t be filled / I remember your strength your love and your laughter / And through me I hope something’s left of you still. Ruby we called you a bright shining jewel / You kept us together through a life that was tough / You buried one child, fought hard for the others / Ruby I wonder did I thank you enough. Lived your life for us kids now that can’t have been easy / Ruby I wonder did I thank you enough. In her own quiet way, my mother, Rebecca Elizabeth McCleary (Ruby) was a fighter. Born into a large Belfast family, she was the only one of three sisters to survive among a whole football team of brothers. It was decided early that “Ruby wouldn’t marry” but would stay at home and look after her mother when the boys were grown and gone. But fate had other plans and my father Ernie was the only man my grandmother couldn’t scare away. When he was 29 and she a year older, he walked his Ruby down the aisle. She used to laugh when she told us stories of how naïve she was then – when neighbours asked if a family was planned, my mother blithely told them that Ernie and she had decided to wait, not realizing that just saying you didn’t want children right away didn’t necessarily prevent pregnancy from happening. At the time, she was already expecting my sister Maureen who was born in May 1939, a few months before the outbreak of WWII. Belfast, because of its shipyards, was a prime target for German bombers and my father, an Air Raid Warden, had to leave the house at the first scream of the warning sirens to make sure everyone got to the bomb shelters – when the all-clear sounded, it was also his job to pull bodies out of the rubble. Ruby, left alone with her tiny daughter and afraid to leave the house, huddled under our kitchen table, praying that they would be spared and that my father would come home safely. Maureen was followed by a second child, beautiful red-headed Derek, who was born with Hydrocephalus (fluid on the brain). The disease went undetected until he was two months old, by which time he was blind and beyond treatment. My parents’ love and care kept him alive for 16 months and when he passed away, it was all Ruby could do not to follow him. Two more of us made an appearance after Derek’s death, first of all me, then my brother Donald (Mum’s “middle-age spread” – or so she thought). When I was about 4, our dire financial situation dictated that Ruby go to work, so off she went every morning to a nine-hour job in a local school kitchen. It was heavy, hard physical work, but she never complained. It had to be done and she did it, keeping the roof over our heads, food on the table and taking care of us all. When retirement came at 60, she put up with being a “lady of leisure” for awhile, then went back to work, helping cook for a local rugby team every Saturday morning. And there she stayed, enjoying the flirting and bantering of “her young men” till her employers had to let her go. She was 80 years old, and very upset not to be “needed” anymore! Mum sang all her life, in the local church choir when she was a young woman, later harmonizing with any of us who raised a tune and sending us off into hysterics with her very theatrical versions of old Music Hall tunes, like I’m Forever Blowing Bubbles or I’m only a Bird in a Gilded Cage. 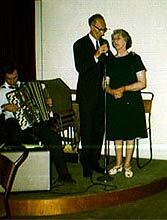 She and my father instilled a good musical ear and a solid sense of harmony in all of us. 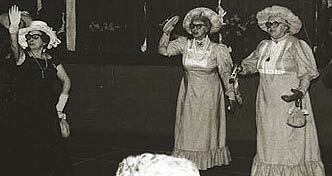 After my father died, Ruby found that she needed some diversion, so, at about 70, she joined The Cregagh Follies, a group of musical seniors who visited Old People’s Homes (as they were called then) to entertain those less fortunate than themselves. They sang the popular songs they all remembered and loved from their youth, encouraging all who could to join in. It was a hobby that gave her and those who heard her a lot of pleasure. 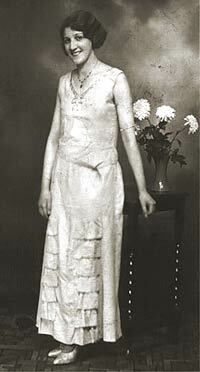 Although I know she must have worried about my gypsy life, she never interfered or tried to stop my wanderings. But I’m sure she must have breathed a big sigh of relief when, after many years backpacking all over the globe, I finally put down roots in Munich in the early 1980s. As often as she could, she came to visit me, making friends with my friends (who all still remember her) and enjoying the outings we were able to take. During her last visit, we celebrated her 84th birthday with all of her German and expatriate buddies. We played a musical game where everyone had to join in and sing something – by that time my mother, due to the weakening effects of an illness, hadn’t sung for years. But suddenly there she was, singing some old favourite, her voice weak at first, then getting stronger as we all tried to pick our chins up off the floor! 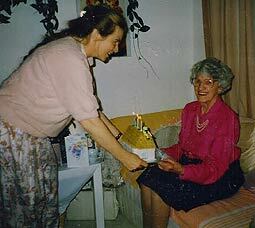 Those who were there still remember that evening and my mother, a frail 84, finding her singing voice again. In the last few years of her life, a serious illness set her back and she never really recovered her energy or her joie de vivre. Ten years ago, in November 1994, she passed away quietly and, I think, grateful to be released at last. I miss her still. The nickname “Jewel” was given to Ruby by her much-loved son-in-law, Jim Murphy, and just about sums up what she was to all of us. Her song took a while to germinate, and it came as a bit of a surprise to me when it turned out to be so upbeat and with a rather unexpected “swing”. But once written, it just took on a life of its own and I’m happy that it developed as it did. It was a tough life and she worked hard for everything we had, but my memories of her are not sad ones – for me, her song is a joyous celebration of a life well lived. Ruby always enjoyed a good tune and when I was recording the vocal track, I had her photo right there with me in the studio. I think she would swing her hips too, and love it. My sister Maureen, fortunately visiting me at a very opportune time, helped me out with some great harmony on one of Mum’s favourite songs Let the Rest of the World go By for the intro and the fade-out at the end of the song and, thanks to the Internet, my nephew Stephen (Maureen’s son and Ruby’s first grandchild) recorded and sent a great guitar accompaniment by eMail. My love and thanks go to both of them for getting in on the act so enthusiastically! My undying gratitude goes to my dear friend and musical companion, Martin Kälberer, who took my little snippet of melody and came up with a more amazing arrangement than I could have hoped for. They never met, but Martin, I know Ruby would have loved you! My mother belonged to that fast-disappearing generation of people who lived for their families and took hardship and sacrifice in their stride. As long as their children were fed and clothed, everything was OK. They “discovered themselves” in caring for their families and found joy in small, everyday things. Had we been financially better off, my mother would have stayed at home to look after us and it would have been all the “career” she needed. They were a tough breed, our parents and grandparents, those who survived World Wars and hardship, dusting themselves off, picking up the pieces and doing what had to be done to get things back on an even keel. They are almost all gone now but they have my deepest respect, admiration and gratitude. I wonder how we are shaping up. Today, October 9, 2004, Ruby would have been 97. Happy birthday Mum. I love you.